The assembled might of the heroes of the world create an army no one can defeat when you shop for Avengers Party Supplies! Incredible decorations like big balloons, fun pinatas, and huge decorating kits make the whole party a blast for all of your heroes, while you can also get tableware like plates and cups, and favors to help them remember the party even after it's finished! Invite Earth’s mightiest heroes to your next bash! 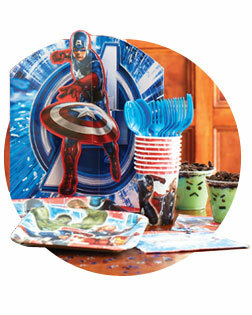 Get ready to throw a "Marvel us” party with our officially licensed Avengers line of birthday and party goods. Your child will be in awe when he or she sees all of the Avengers arrive on party day. Originally consisting of Iron Man, Ant Man, the Wasp, Thor and the Hulk, we’ve got them all! The original Captain America was trapped in ice, discovered and then invited to join the group after they revived him. A rotating roster became the hallmark, although one theme remained consistent: the Avengers “fight the foes no single superhero can withstand." The team, famous for their battle cry of "Avengers Assemble” has featured humans, mutants, robots, aliens, supernatural beings, and even former villains. Get things started early the day of the party by creating your own personalized Avengers artwork. Designed by you and your little one, it’s a great way to spend quality time together. And with our selection of party supplies, you’ll be Avenging villains and taking superhero strength to the next level in a flash! Party planning can be frustrating, but there’s no need to stress out and turn into the Incredible Hulk! It's easy to get the perfect Avengers party started with all of our Marvel Comics-inspired supplies. From setting the stage to rockin' the costumes, you’ll be transported to another dimension where make-believe becomes real in no time! Suit up as your favorite Avenging hero and join us for ____'s 10th birthday party! It’s going to be a super-sized super bash, so gather your accessories and get here fast. We’ll be celebrating all day in epic style, so put on your mask, grab your shield and join the team! Is it a bird, is it a plane? Nope, it’s all the Avengers accessories you can fit in a room ready to bring their mighty powers to your birthday or theme party! These superhuman forces from the movies and classic Marvel comic books appear on all of our colorful party supplies. Choose from action-packed adventure scenes to bright-colored plates and coordinating cups. Avengers balloons and backdrops will fill up your air space for a superhero style celebration that will leave your guests feeling like justice has been served! Every party needs balloons and our Avengers assortment is just the ticket to fill your air space. Featuring all the avenging defenders in action, your guests can’t help but take a cue from their favorite superhero and spring into party mode in no time. 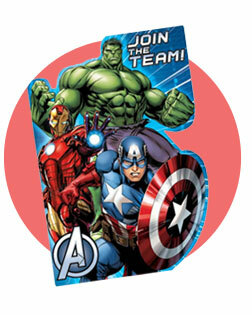 Power up your festivities with our awesome Avengers decoration kit. These avenging superheroes are ready to help you spring into action at a moment's notice. Featuring multiple pieces that are easy to assemble, they add excitement to your party room and are dynamic to display. When the young superheroes get thirsty from all their crime fighting, serve up delicious hot or cold beverages in one of our Avengers cups. Find yourself in a messy bind? No need to worry because the Avengers are on the job! The exciting Avengers lunch napkins feature an action-packed print of Thor, Iron Man, Captain America and the Hulk racing forward against a background exploding with bright blue. When it’s time to serve, pass out these super-cool plates, color coordinated with all the utensils every crime fighter needs to fantastically clean up the scene! Suit up and save the day by keeping your crime fighters entertained at the party. These awesome activities will have your heroes’ imaginations running wild and working together like the real Avengers. In less time than you can say power boost, you can rally your crime fighters into action with this superhero twist on Pin the Tail on the Donkey. First blindfold guests, then let them take turns trying to land an arc reactor sticker on Iron Man's chest. Saving the world is tough work, but you’ll get votes and applause when you get all your Avengers together for these awesome party activities! Let your superheroes practice their moves on an Avengers Piñata. Laughs will fill the room as your little crime fighters try to break open the piñata. Smaller kids can take turns pulling each string to reveal the treats inside! “Avengers Assemble” and take aim! This superhero twist on Pin the Tail on the Donkey will have everyone enjoying the challenge. First blindfold guests, then let them take turns trying to land an arc reactor sticker on Iron Man's chest. Laughing never felt so good! All the Avengers are ready to bring their mighty powers to your birthday party festivities! 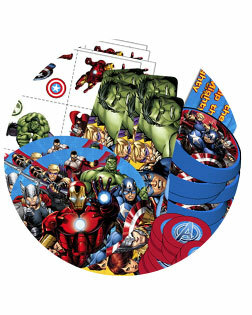 The superhuman forces from the popular movies and classic Marvel comic books appear on all our colorful party favors. There’s no better parting gift than a goody bag, and our fun-filled Pez dispensers feature all their favorite characters dispensing tasty treats. Add their favorite Avenger’s mask to the mix and top things off with an original piece of art they created on a plate or cup. Your guests will leave happy after having a super-riffic day of crime fighting to remember! Nothing gets them into character more quickly than the perfect mask! Crime fighting doesn’t get any better than donning your favorite Avenger character’s mask and costume and heading out to do some good! Choose from Iron Man, Thor, the Hulk or Captain America, and let the games begin! 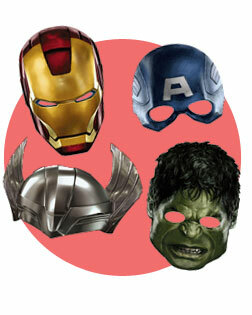 Send your partygoers home with memorable party favors from our Avengers memorabilia pack. Be prepared to have all your superheroes head off into the sunset in super-hero style after a day of crime fighting at a celebration that will leave all your guests feeling like justice has been served!